Russian Navy spy ship Liman sank after collision with the livestock carrier Youzarsif H on 25 nautical miles north-west from the Bosporus estuary in the Black Sea off Turkish coast. The accident happened in dense fog near the Turkish village Kilyos and navy vessel suffered breach in the port board. The 78 crew tried to pump the water out and to keep the ship afloat, but unfortunately they were unable to get control over the flooding. Turkish authorities dispatched a tugboat and three fast rescue vessels. The Russian cargo ship Ulus Star was in vicinity and headed to the scene of the accident and evacuated all the crew from the troubled navy ship. Also tugs from Russian naval base in Black Sea, as well as warships and an aircraft, rushed to reached the scene of the accident and assist of the sinking ship, but unfortunately did not arrived on time. The livestock carrier Youzarsif H did not suffered any breaches and reported the accident to the local authorities and shortly after that was released to return in service and resumed the voyage from Capu Midia to Aqaba. The investigation for the root cause of collision is under investigation, but possibly it happened due to human mistake and violation of the ColReg rules. Advisers to Turkish Prime Minister Binali Yildirim conveyed his sadness over the incident to Russian counterparts. The livestock carrier Youzarsif H (IMO: 7611547) has overall length of 132.00 m, moulded beam of 13.00 m and maximum draft of 5.50 m. The deadweight of the ship is 2,103 DWt and the gross tonnage is 2,282 GRT. The vessel was built in 1977 by JJSietas Schiffswerft in Hamburg, Germany. 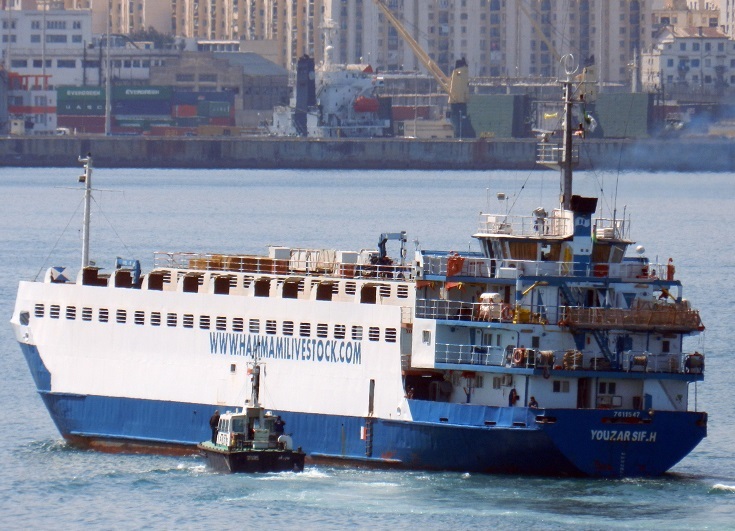 During the accident, the ship was en route from Capu Midia to Aqaba.